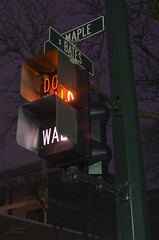 While shooting a panorama at the corner of Maple & Bates in Birmingham, Michigan this cross walk light caught my eye. I'm not sure if it was the fact that this is one of the few older non-LED indicators left, or the wasp nest under the hood of the DON'T WALK sign. I would have liked to spend more time on this one, but the snow was starting to really get in the way.